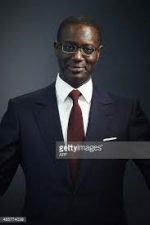 Tidjane Thiam (born 29 July 1962) is an Ivorian businessman and former politician who became the Chief Executive of Credit Suisse in June 2015. Born in Côte d’Ivoire, he holds dual Ivorian and French citizenship. He studied advanced mathematics and physics in France before joining the management consultants McKinsey & Company in 1986, where he worked until 1994. From 1994 to 1999 he worked in Côte d’Ivoire first as Chief Executive of the National Bureau for Technical Studies (BNETD), reporting directly to the Prime Minister and the President, and from 1998 as both Chairman of the BNETD and Minister of Planning and Development. Following the Ivorian coup of 1999, he resumed a private sector career and rejoined McKinsey in Paris from 2000 to 2002, then worked as a senior executive for Aviva before being recruited by Prudential plc. When appointed the chief executive of Prudential in 2009, he became the first black person to lead a FTSE 100 company. On 10 March 2015, it was announced that Thiam would leave Prudential to become the next CEO of Credit Suisse, succeeding Brady Dougan. In December 1993, the first Ivorian President, Félix Houphouët-Boigny, died and was replaced by Henri Konan Bédié. In April 1994, at the request of the new President, Thiam left France and McKinsey to go back to Abidjan and become the CEO of the National Bureau for Technical Studies and Development (BNETD), an infrastructure development and economic advisory body with more than 4,000 staff, reporting directly to the President and the Prime Minister. In that role, which had cabinet rank, he was also handling key negotiations with the International Monetary Fund and the World Bank. Thiam was also a key member of the Privatization Committee, in charge of privatising extensive state-owned assets. In August 1998, in addition to his role at the BNETD, where he became chairman, Thiam formally joined the cabinet and was appointed Minister of Planning and Development. In his years in Côte d’Ivoire, Thiam promoted private sector involvement in infrastructure development. He implemented flagship projects including the Azito power plant (nominated by the Financial Times as one of the boldest successful investment decisions in the world, the renovation of Abidjan airport and the construction of the Riviera Marcory toll bridge, whose financing was closed a few days before the 1999 coup. One of the first actions of the new President, Alassane Ouattara, in 2011 was to start the construction of that bridge as originally overseen by Thiam, with the same promoters. Thiam actively promoted an extensive privatisation programme which saw, between 1994 and 1999, Côte d’Ivoire lead African countries by privatising its telephone, services, electric power generation, airports, railways and many companies in the agricultural sector. In 1998, the World Economic Forum in Davos named him as one of the annual 100 Global Leaders for Tomorrow, and in 1999 the Forum named him a member of the Dream Cabinet. In December 1999, whilst Thiam was abroad, the Ivorian military seized control of the government. Thiam returned to the country, where he was arrested and held for several weeks. General Guéï, the new head of state, offered him the position of chief of staff, but he declined and left the country in early 2000. Thiam left Aviva in September 2007 to become chief financial officer of Prudential plc. In March 2009, Thiam was named chief executive, effective from October, after Mark Tucker chose to step down. The appointment made him the first African to lead a FTSE 100 listed company. His departure from the role was announced on 10 March 2015. After he became chief executive, Prudential launched a bid for AIA, the Asian wing of the crisis-stricken AIG. A public battle ensued, with some investors complaining about the $35.5 billion price Prudential was offering to pay. The bid eventually failed, after the AIG board rejected a revised lower bid. AIA was later floated on the Hong Kong Stock Exchange, and the value of the company quickly rose above Prudential’s original bid price. Thiam came under strong personal criticism following the failure of the bid, partly as a result of the costs incurred by the company in pursuing the bid. However, he was re-elected as CEO at the May 2011 AGM with a 99.3 per cent vote. The company’s performance since the bid appears not to have been damaged by its failure – in the first nine months of 2011, Prudential delivered a 14 per cent increase in new business profits over the same period in 2010, with total insurance sales increasing by 10 per cent, while in its full-year results for 2013, Prudential delivered an IFRS operating profit of £2.95 billion, up 17 per cent from the year before. In March 2013, the Financial Services Authority fined the Prudential £30m and censured its CEO, Thiam, for failure to inform it of its plans to buy AIA and failure of dealing with the FSA in an open and cooperative manner.